Yankees pitcher David Cone, eleven days after his perfect game. Cone's perfect game was the 247th no-hitter in MLB history, and 11th, and to date last no-hitter in Yankees history. 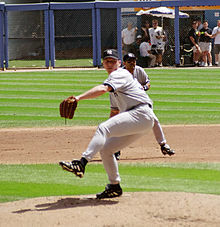 The previous perfect game in both MLB and Yankee history was 14 months prior on May 17, 1998, when David Wells pitched a perfect game against the Minnesota Twins at Yankee Stadium; Wells' perfect game was also the most recent no-hitter in franchise history at the time. Cone's perfect game gave the Yankees the record for the franchise with most perfect games, breaking a two-perfect game tie with the Cleveland Indians. Since Cone's perfecto, the Oakland Athletics, Philadelphia Phillies, and Chicago White Sox have recorded their second perfect games, with the White Sox tying the Yankees with a third perfect game in 2012. To date, Cone's perfect game is the only one achieved in regular season interleague play. Outfield assists: Jones, T (Girardi at 3rd base). 2B: Girardi (9, Vasquez); O'Neill (20, Vasquez). HR: Ledee (3, off Vasquez, 2nd inning, 1 on, 1 out); Jeter (16, off Vasquez, 2nd inning, 1 on, 2 out). TB: Jeter 4; Ledee 4; O'Neill 2; Girardi 2; Knoblauch; T. Martínez; Williams, B; Davis, C.
RBI: Jeter 2 (64); Ledee 2 (13); Girardi (10); Williams, B (55). ^ "'FOR BASEBALL JUNKIES- Where baseball fans of all ages come to discuss the biggest stories in baseball and the history of America's pastime. Trivia, Opinion, Top 10 Lists, Fantasy and more.'". Baseballjunkies.blogspot.com. July 1, 2011. Retrieved December 12, 2011. ^ "David Cone Perfect Game Box Score by Baseball Almanac". Baseball-almanac.com. July 18, 1999. Retrieved December 12, 2011. ^ "Don Mattingly At Yogi Berra Day July 18, 1999". Donniebaseball.com. Retrieved December 12, 2011. ^ a b "Baseball's Best | MLB.com: Programming". Mlb.mlb.com. Retrieved December 12, 2011. ^ "Ruminations – November 19, 2000". NetShrine. November 19, 2000. Retrieved December 12, 2011. ^ "Classic Yankees: David Cone". Bronx Baseball Daily. September 16, 2011. Retrieved December 12, 2011. This page was last edited on 23 April 2019, at 19:49 (UTC).